Long Cane ARP Church is located in the northern part of McCormick County in South Carolina. Be advised that GPS navigation units can't always be trusted in this rural section. Using the physical address of the church, 1591 Long Cane Road, Troy, SC will usually NOT lead to the church. However, using the phrase 'Long Cane Church' will navigate to the correct location. Below is a link to Google Maps which is already pointed at Long Cane Church. Click on the link below then enter your starting point for turn by turn directions to the church. 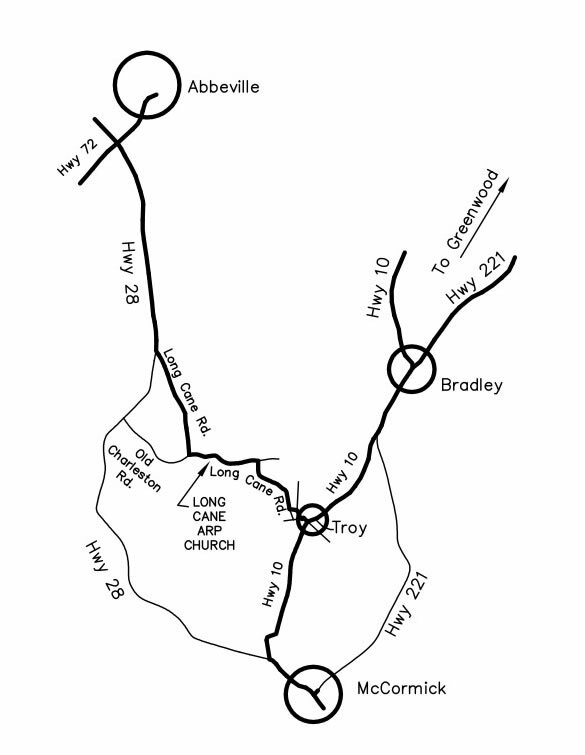 Below is a road map drawn by Darryl Newby for getting to Long Cane Church from Abbeville, Greenwood or McCormick, South Carolina. Allow 45 minutes leisurely driving time from Greenwood and 30 minutes from Abbeville or McCormick.